Somehow (I don't remember when/how) the idea was planted in my head that the water at Sante Adairius Rustic Ales had elevated levels of sodium and chloride, possibly because they are using well water and are pretty close to the ocean. Since hearing that I feel like I can taste a bit of that saltyness in their beers. Though recently I have looked back to substantiate this long-held idea of mine, I have not been able to find a source to clearly confirm (or invalidate) that information. 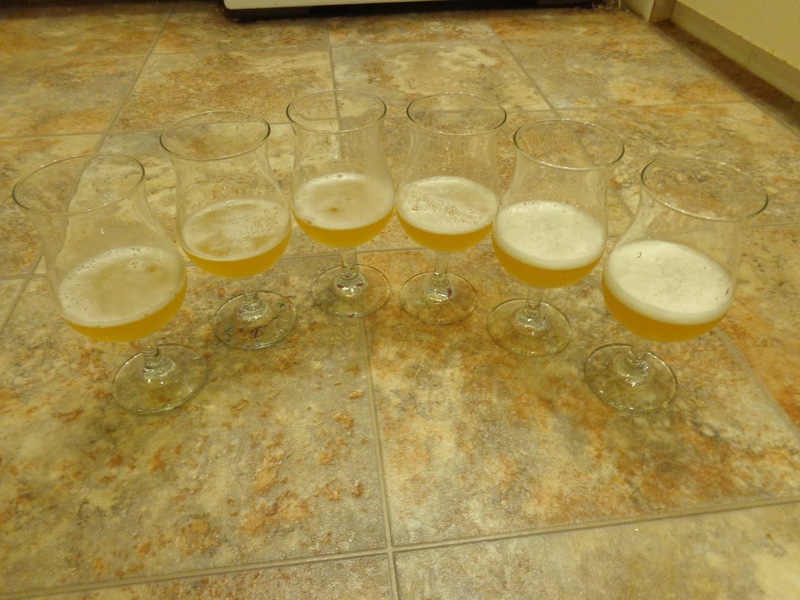 Whatever the case, drinking some of the fantastic saison-oriented beers from Sante Adairius and perceiving a mild saltyness, the the idea was planted to brew a saison with elevated sodium chloride. Mashing under my rainy day tarp. If you aren't familiar with Sante Adairius (SARA for short) they are a small brewery in Capitola, near Santa Cruz Ca. They produce some of the best saisons I've had (along with some really solid hoppy beers) and I really like the outlook that the brewer Tim has. I've never met him, but he shares some of his ideas in his interview on the Brewing Network's Sour Hour. 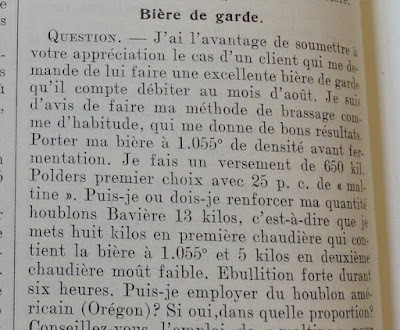 In the interview he also talks about his saison yeasts (he is using a blend of Belgian and French saison yeasts) and he mentions that his water as a high mineral content, and even uses the term 'salty' to describe it (but never specifically mentions sodium or chloride and mentions that pre-boiling the water helps some of these mineral problems suggesting that temporary hardness may be an issue). So whether or not SARA actually has elevated sodium chloride, the idea was born and I wanted to try brewing a saison with higher sodium levels. Generally sodium is advised against in brewing and suggested maximum levels are around 75 ppm or below, but up to 150 ppm could be okay. However some styles can make use of higher sodium (such as Gose, a tart German style from the Leipzig area with additions of coriander and salt). Shortly after I put this beer in my brewing schedule I learned from my friend and local maltster Mike Doehnel that he was going to malt some barley that was grown next to the beach at Island View rd. in Saanich (I talked a bit more about Doehnel malts in this post). This seaside-grown barley fit perfectly with the beer I had in mind. In order to determine how much salt to use for this I did a bit of searching around for what others had done in Gose homebrews. From these values (in g/gallon) I came up with a range of what I wanted to try in ppm from a bit below Gose levels to a bit above. I weighed out the ranges table salt into 50 mL vials and dissolved the salt in 10 mL of water. From these salt solutions I prepared a tasting with 6*10 cl pours from one 750 ml bottle of a previous saison. Each was spiked with 1.1 mL (5 with the concentrated salt solutions and one with 1.1 mL of water as a blank). The final levels in each of the glasses are shown in the table below. Because neither sodium nor chloride are important in hitting pH levels (unlike calcium and the carbonate system), spiking the finished beer in the glass probably comes closer approximating the effect of Na and Cl in the brewing water throughout the process. On first tasting I noticed the actual salt in glasses 3-5 (they tasted salty), but in all the glasses I was able to see an overall difference in the beers (from mouthfeel and flavor changes that aren't as identifiable salty-oriented). At first sip nothing was too salty to drink. There was a significant difference between what seemed like an appropriate level at first and what I decided in the end. This may be partially due to the beers warming but I think it might have more to do with the differences between the right level for a few sips and the right level for a small glass. With this reasoning I extrapolated from what I liked in the 10 cl pours to what I would want for a batch (especially knowing that I can always add more salt but removing it isn't an option unless I blend in another beer). The 5 salt spiked samples and the blank. As the beers warmed I could taste the salt (saltyness in addition to the other changes mentioned above) in all of them. By the end glasses 4 and 5 were far too salty and I didn't want to finish them. Glass 3 was too salty for this beer but drinkable and maybe more in line with what I might want for something more salt-forward like a Gose. The switch from pleasantly salty to too salty for this beer (when tasting small amounts from the glasses) happened between glasses 2 and 3. For one small 10 cl glass, glass 2 was possibly about the right amount. But glass 1 was rather pleasant and probably better for drinking larger volumes. There was still a touch of saltyness, at least when I was looking for it, but the impact was more on the mouthfeel and the overall flavor than the flavor of saltyness. I decided to go for a bit less than what was in glass 1 for this batch based on the reasoning above and because I'm not looking to create a salty saison (by that I mean a saison tat tastes salty) but rather a more subtle beer with the influence of elevated sodium. 82.4% Doehnel #30 (Pils oriented malt would work as a substitute) - note that this malt has a lower level of moisture than the average malt so my extraction was a couple points higher than the average pils malt. The percentages of grains in Beersmith are by weight, not extract, so increasing the pils portion if a normal pils is used would closer match this grist. As I have regularly been doing for recent saisons, I brewed enough to fill a carboy for a mixed yeast and bacteria fermentation and longer term aging. To that carboy I pitched some dregs from sour saison oriented beers that I enjoy as well as some brett strains that have a good mix of fruityness in addition to milder funk and a Lactobacillus strain. This carboy received Yeast Bay amalgamation Brett blend, ECY04 Brett anomala, Crooked Stave brett (from the 30 gallon oak barrel I share with two friends), Upright flora dregs and Wyeast 5223 Lacto brevis. I used my typical 2 step saison mash profile of 146 F (63.3 C) for 50 minutes and 154 F (66.7 C) for 20. I didn't mash out above 158 F (70 C) to prevent denaturing the enzymes and allow conversion throughout sparging and into the kettle. I did a 90 minute boil expecting 1 gallon per hour of boil off and 1.25 gallons of trub loss. I pulled about 2 l of wort before adding hops to activate/wake up the 3724 I had in the fridge. I am doing a couple trials to see if it helps this finicky yeast to go into a fermentation active rather than dormant. The Sterling was added with 40 minutes left in the boil and the Saphir was added at flame out. I did a 25 minute hot steep/whirlpool. I pitched at ~68 F (20 C) and raised it to 78 F (25.6 C) over the first 3 days, where it is sitting now. The final wort was pleasantly different from previous saisons I've made with a similar recipe. I couldn't really pick out salt, but I imagine that had something to do with it. I'll fill in updates as this beer progresses. Here are tasting notes for the Seaside Saison.